If you follow Winterton Racquetball on Facebook, you’ll notice that Jim Winterton mentions the titles of books with some frequency. He isn’t always the best at providing the author’s details, so finding out the real book he’s discussing can take some extra effort. Today’s newest mention (June 17, 2016) was clear, but had one of the author’s names spelled incorrectly. This book was just published in April of 2016, and is by Anders Ericsson and Robert Pool. 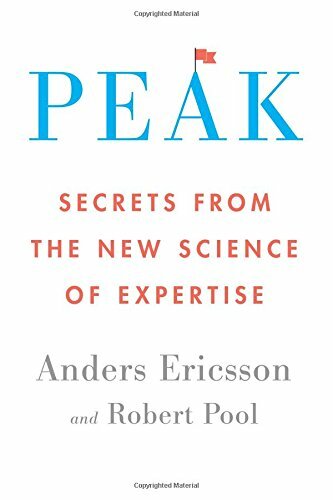 The title is Peak: Secrets from the New Science of Expertise. Ericsson’s research is frequently quoted in sports practice books, so it will be good to read his own interpretation of his results rather than reading another person’s selective interpretation. When shopping on Amazon, I use the option to have Amazon donate a percentage of every sale to a charity. When you first go to that site, you are invited to choose your charity. If you search for ‘Racquetball’, there are 62 options that come up. Some are state or city racquetball associations. Some are bigger more widely applicable charities, like USA Racquetball, the US Military Racquetball Foundation, or the National Masters Racquetball Association. Quite a few are YMCA’s or JCC’s. Currently, I support the Reaching Your Dream Foundation. RYDF doesn’t come up in the search for ‘racquetball’, but you can type it in manually. Next Next post: Collegiate Racquetball – what makes a successful club?